Do you like origami? Do you like dragons? Well I have found the perfect book for you! Origami Dragons by Tom Stamm. 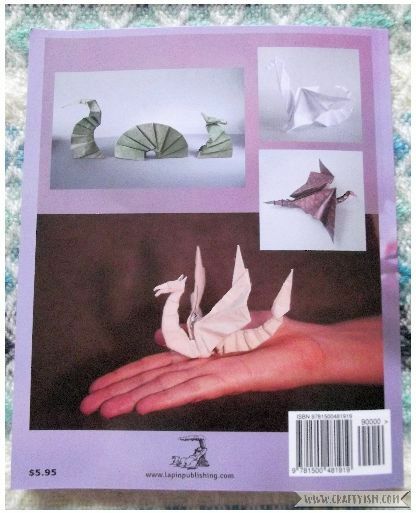 This little book is less than 40 pages long but it contains 6 different origami dragons. They are all designed by Tom Stamm and JC Nolan who also designed the folding diagrams. There are 3 flying dragons, 2 standing dragons and a multi piece sea serpent to attempt! I would say I am an intermediate origami folder, but I did struggle with some of the designs in this book. There’s one fold which is repeated in a few different designs which I just can’t get. As a result, I have a number of half finished paper dragon carcasses lying around! The best place I have found for learning origami (and most crafts really) is YouTube. If I get stuck I’ll check to see if there is a video I can follow to clarify the drawn diagrams. But did you know that origami designs are a lot like books or art and should not be reproduced without the creators consent? Origami folders are very respectful of this unfortunately, so I could find no video tutorials of these designs. I did finish the Flapping Natasha which I think is probably the easiest model in the book. (Probably why I was able to finish it!) But when you pull it’s tail, the wings flap, so that’s fun! 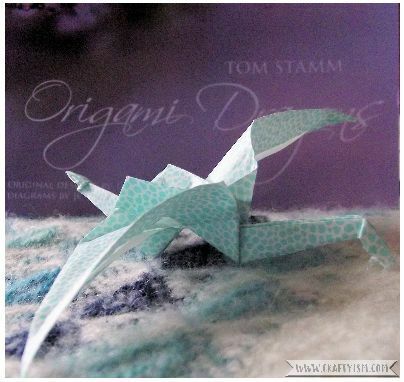 If you do like origami I think you’ll enjoy Origami Dragons by Tom Stamm. If you’re not an expert, then you’ll enjoy it for the challenge. If you are an expert, then you’ll enjoy these instructions that you won’t find elsewhere. This is not a book for beginners as there are no written instructions, only the diagrams to follow. However, if you’ve tried a few different origami models, why not challenge yourself and try an origami dragon? If you’ve finished any of the models in this book, please let me know. Maybe you can help me on the steps I’m stuck on!